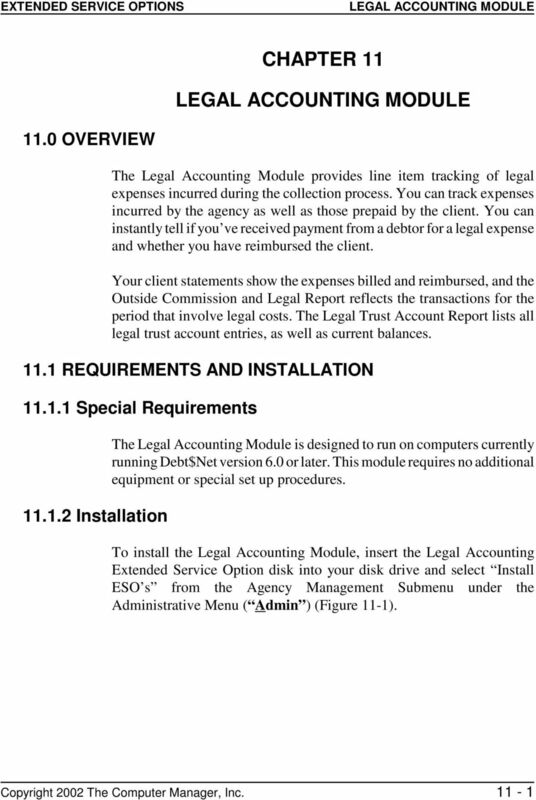 Download "CHAPTER 11 LEGAL ACCOUNTING MODULE 11.0 OVERVIEW 11.1 REQUIREMENTS AND INSTALLATION. 11.1.1 Special Requirements. 11.1." 2 EXTENDED SERVICE OPTIONS Figure Install Eso s Menu Option. The Select Directory Form displays prompting you to select the drive where the ESO disk is located (Figure 11-2). If the displayed location is incorrect, specify a new location using the Drive drop down list at the bottom of the form. After selecting the correct drive, click the Select button to begin installation. Figure Select Directory Form Copyright 2002 The Computer Manager, Inc.
4 EXTENDED SERVICE OPTIONS Figure Flagging Pre-Pay Legals? Field ADDING LEGAL COSTS FOR AN ACCOUNT When an account reaches the legal phase of the collection process, you need to track who paid for each expense incurred, whether the debtor paid the expense, and if the client was reimbursed any advanced funds. 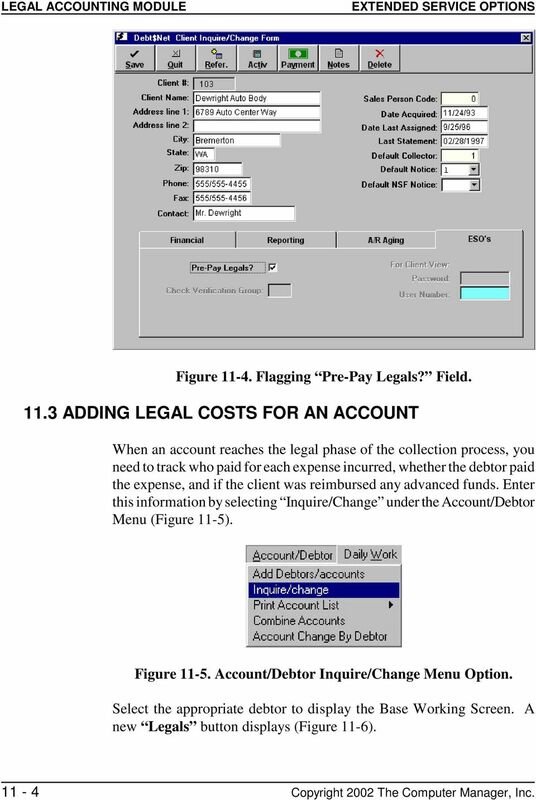 Enter this information by selecting Inquire/Change under the Account/Debtor Menu (Figure 11-5). Figure Account/Debtor Inquire/Change Menu Option. Select the appropriate debtor to display the Base Working Screen. A new Legals button displays (Figure 11-6) Copyright 2002 The Computer Manager, Inc.
6 EXTENDED SERVICE OPTIONS Figure Legal Selection Form. The Total Fees field at the bottom of the form displays the total of all entered expenses for this debtor. The Trust Balance fields contain the current balance of the amount the client pre-paid for legal expenses (first field) and the original amount the client pre-paid (second field). 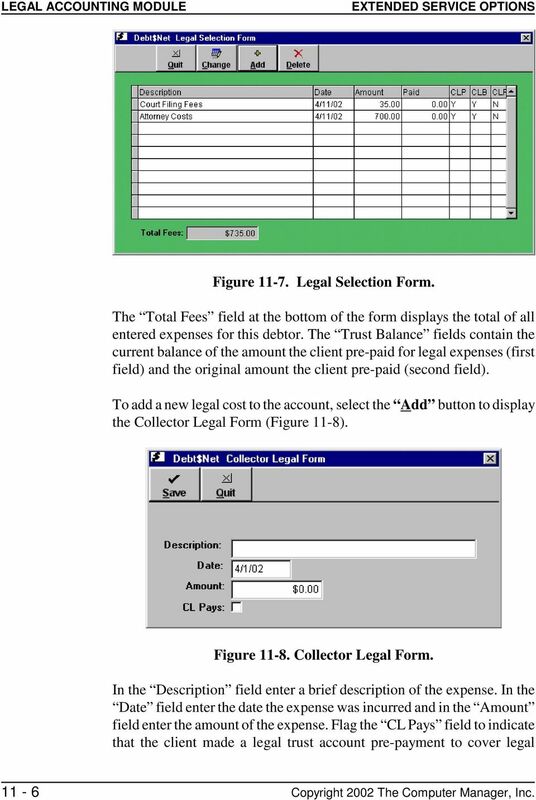 To add a new legal cost to the account, select the Add button to display the Collector Legal Form (Figure 11-8). Figure Collector Legal Form. In the Description field enter a brief description of the expense. In the Date field enter the date the expense was incurred and in the Amount field enter the amount of the expense. 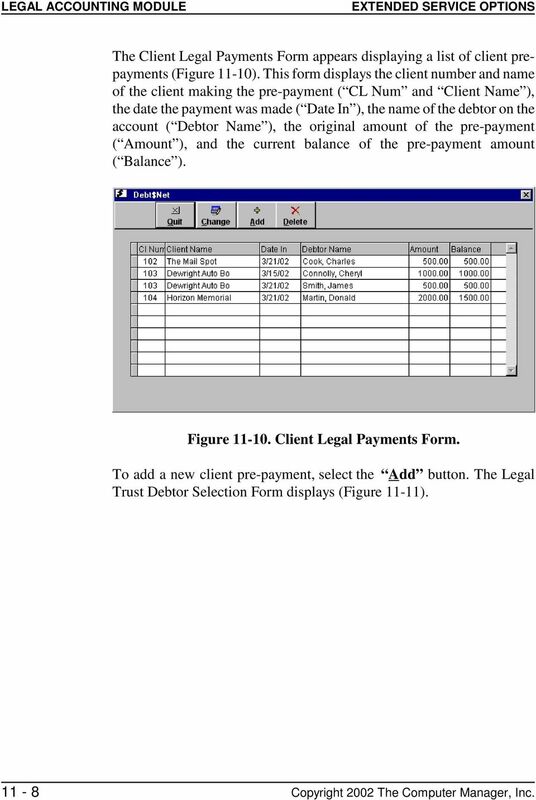 Flag the CL Pays field to indicate that the client made a legal trust account pre-payment to cover legal 11-6 Copyright 2002 The Computer Manager, Inc.
8 EXTENDED SERVICE OPTIONS The Client Legal Payments Form appears displaying a list of client prepayments (Figure 11-10). This form displays the client number and name of the client making the pre-payment ( CL Num and Client Name ), the date the payment was made ( Date In ), the name of the debtor on the account ( Debtor Name ), the original amount of the pre-payment ( Amount ), and the current balance of the pre-payment amount ( Balance ). 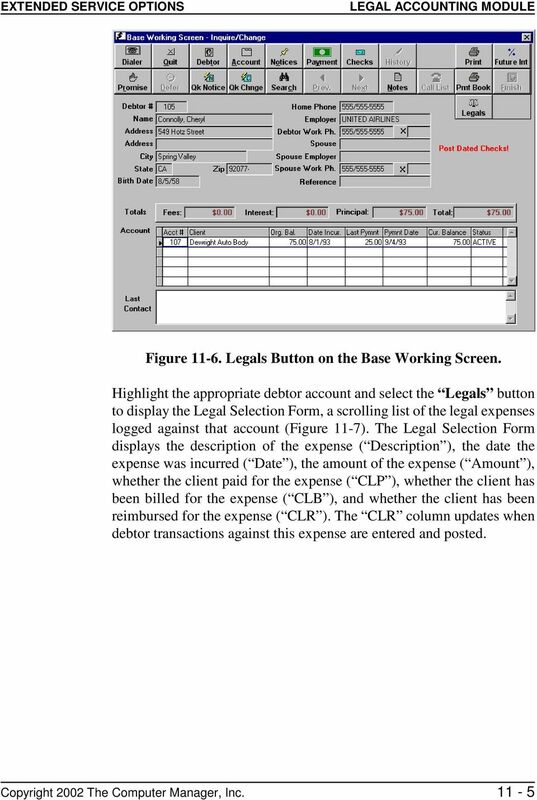 Figure Client Legal Payments Form. To add a new client pre-payment, select the Add button. 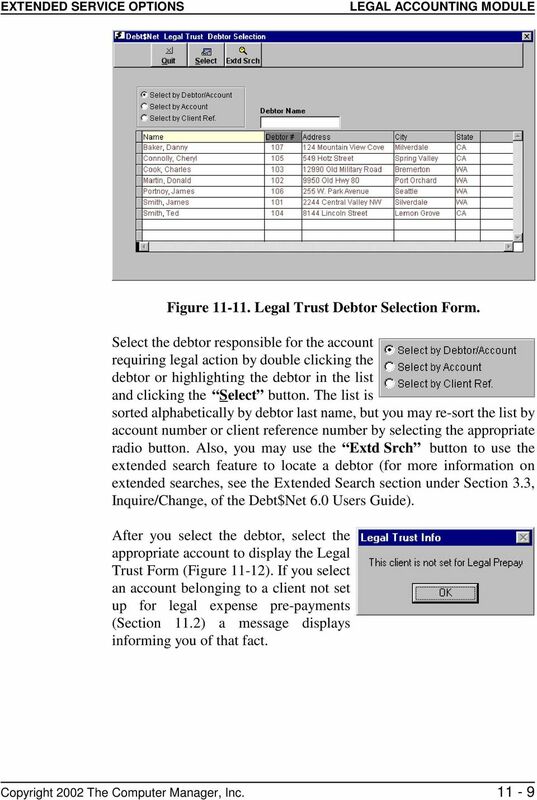 The Legal Trust Debtor Selection Form displays (Figure 11-11) Copyright 2002 The Computer Manager, Inc.
10 EXTENDED SERVICE OPTIONS Figure Legal Trust Form. Enter the date the pre-payment was received in the Date field, and enter the amount of the payment in the Amount field. Select Save to save the entry. Legal fees paid by the client (indicated by a flag in the CL Pays field on the Collector Legal Form) deduct from this balance. 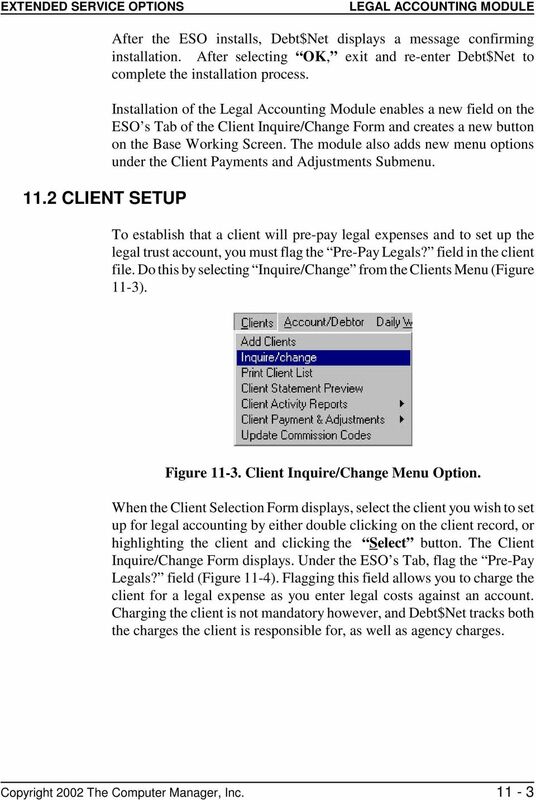 To view or edit a pre-payment, highlight the payment on the Client Legal Payment Form and select the Change button. 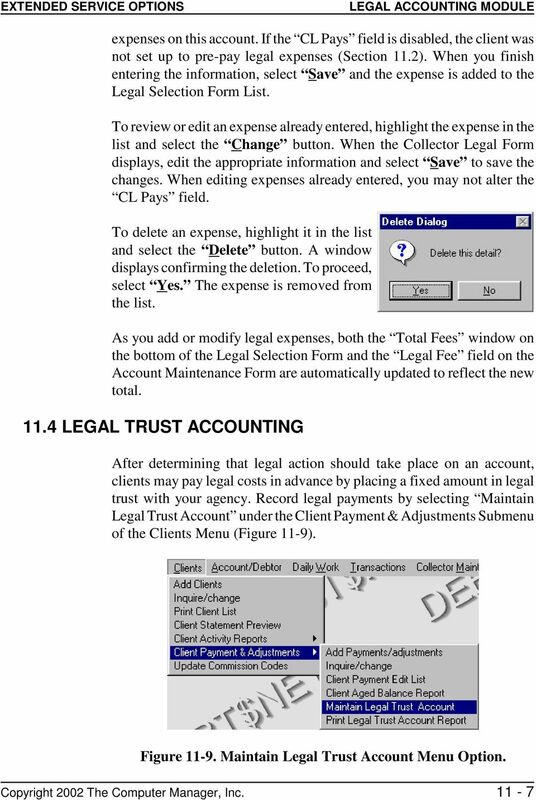 When the Legal Trust Form displays, review or change the necessary information and select Save to save your changes. Select Quit to exit the form without making changes. 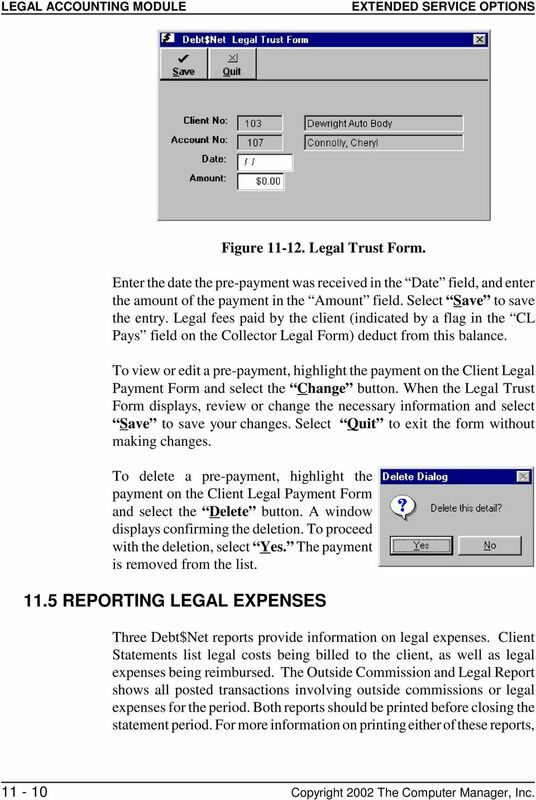 To delete a pre-payment, highlight the payment on the Client Legal Payment Form and select the Delete button. A window displays confirming the deletion. To proceed with the deletion, select Yes. The payment is removed from the list REPORTING LEGAL EXPENSES Three Debt$Net reports provide information on legal expenses. Client Statements list legal costs being billed to the client, as well as legal expenses being reimbursed. The Outside Commission and Legal Report shows all posted transactions involving outside commissions or legal expenses for the period. Both reports should be printed before closing the statement period. 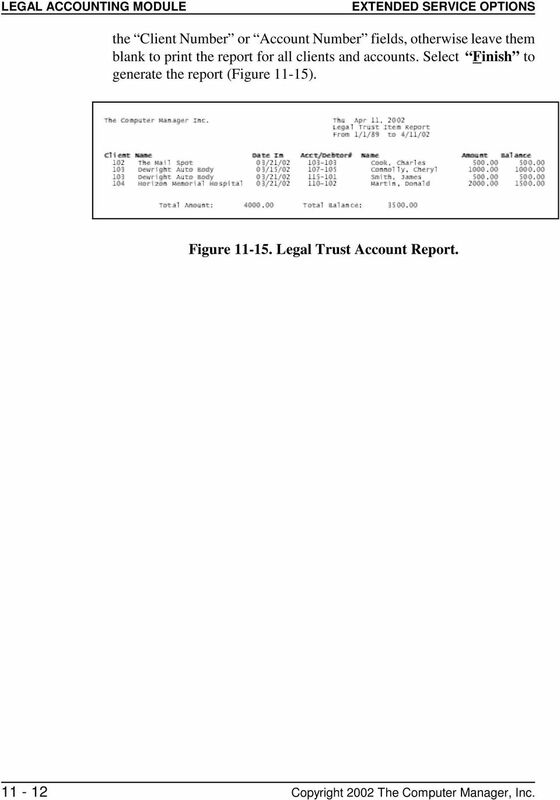 For more information on printing either of these reports, Copyright 2002 The Computer Manager, Inc.
12 EXTENDED SERVICE OPTIONS the Client Number or Account Number fields, otherwise leave them blank to print the report for all clients and accounts. Select Finish to generate the report (Figure 11-15). 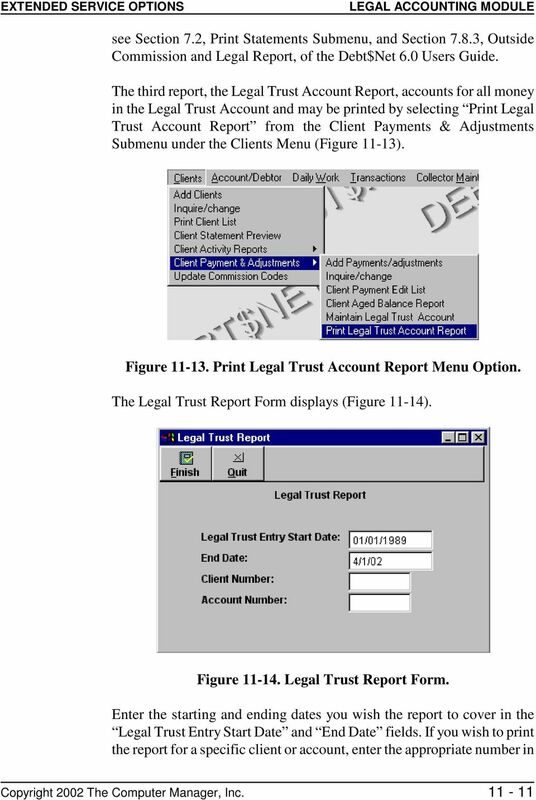 Figure Legal Trust Account Report Copyright 2002 The Computer Manager, Inc.
CHAPTER 14 PREDICTIVE DIALING INTERFACE MODULE 14.0OVERVIEW 14.1 REQUIREMENTS AND INSTALLATION. 14.1.1 Special Requirements. 14.1. CHAPTER 14 PREDICTIVE DIALING INTERFACE MODULE 14.0 OVERVIEW 14.1 REQUIREMENTS AND INSTALLATION. 14.1.1 Special Requirements. 14.1. CHAPTER 7 CONSUMER CREDIT BUREAU REPORTS 7.0 OVERVIEW 7.1 REQUIREMENTS AND INSTALLATION. 7.1.1 Special Requirements. 7.1. CHAPTER 27 EXPERIAN COLLECTION ADVANTAGE. 27.1.1 Special Requirements 27.0 OVERVIEW 27.1 REQUIREMENTS AND INSTALLATION. 27.1.
customer rewards Use this guide to create customized customer rewards and redeem points earned by customers. A division of HNA Computer Systems, Inc. ECLIPSE & Faircom ODBC Driver Getting started is actually quite simple and like most things if you follow all the right steps you should not have any problems. Web Time Sheet Instructions For Management, Academic Professional (Full Time), and Classified (Full Time) Important Things to Note: Remember to use the and buttons to see additional days in the pay period. QUICK START GUIDE. Draft twice the documents in half the time starting now.